For most people visiting Catalonia and its capital, Barcelona, wine isn’t often the first thing on their mind. Most of us head to the beach, shop, enjoy the nightlife, visit museums or meander about the ancient cities and villages that define the history and culture in this Catalan part of Spain. For those who make it up to the northeast of Catalonia, perhaps to visit the Dalí Museum in Figueres, you’ll find yourself in a whole different world from Barcelona. In the midst of the two Empordà counties or comarcas, you’ll see vineyards spilling out across the plain and up the sides of the mountains up and down the potentially more well-known beach region of Costa Brava. Founded in 575 BC, the Ancient Greek city of Empúries (Emporion meaning “market”) is where it all began for this area, and even where Empordà gets its name from. These Greeks are thought to have originally brought grapevines to the region and made it with great abundance. This city thrived on trade and grew rapidly, moving quickly from the island it was founded upon to the mainland. 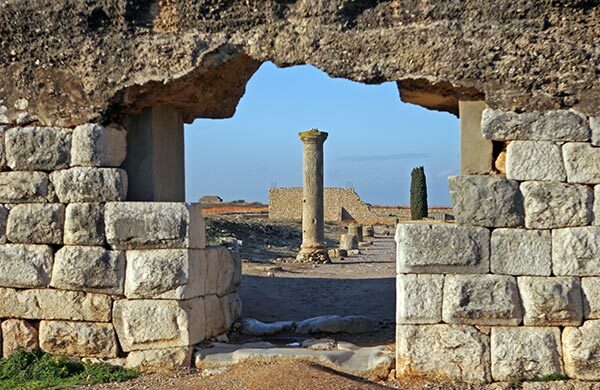 These ruins can still be seen today, located just north of L’Escala on the way to the charming little village of Sant Martí d’Empúries (who hosts the interesting Arrels del Vi wine fair yearly in April-May). There is also an archaeology museum onsite displaying many wine-related artifacts. In 218 BC, Empúries fell under Roman control like much of the Mediterranean. The Romans greatly expanded the city with a new area that dug further in to the mainland. They continued wine production and trade, as proven by the many amphorae found all over the Empordà area. The Romans also founded many other cities around this region, in rural areas often organized around villas that included accommodation buildings as well as workshops and storage areas. Many of them along the Baix Empordà and La Selva comarcas specialized in wine, and some even had their own brickyards to build amphorae. Unfortunately, these Hispanic Romans chose the wrong side in a Roman civil war and were stripped of the autonomous status they had enjoyed. With the fall of the Roman Empire in the 4th century AD and the arrival of the Visigoths, Empúries also went in to a heavy decline, especially as other towns such as Girona and Barcelona grew. Wine was still produced in the area, but it was at a small, local level. With the rise to power of the Counts of Empúries, winemaking also increased, not only in Empúries, but in the other medieval counties in the region as well. A great deal of this was because during the 10th century they indroduced a system through which peasants who planted vineyards in the lord’s domains would be given ownership of half of those vines after a few years. They also funded the local monasteries and the monks made wine. So during this time and throughout the 11th century vineyards greatly increased in all of the Empordà region, and particularly in the Cap de Creus area. 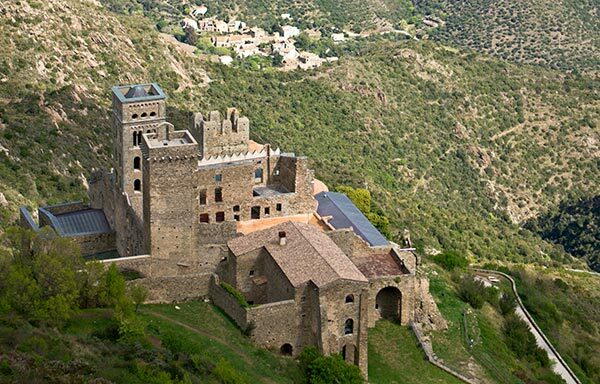 Notable monasteries were those in Sant Pere de Rodes, Sant Quirze de Colera, and Santa Maria de Vilabertran; the edifices for all of them still exist today and can (and should) be visited. The 16th and 17th century saw many wars between France and Spain, plague epidemics and pirate attacks that made tending to the vineyards difficult. The 18th century was somewhat more stable, although the vineyards owned by the church had dwindled. A new type of land contract was introduced that, once again, helped increase the amount of vineyards grown in Empordà. It was an usufruct lease called rabassa morta that allowed poor peasants to grow vines in a plot of land until two thirds of them died, which meant they could enjoy them for 50 or more years. In the second half of the 18th century the wine business was booming, alongside olive oil and cork production. Up through the 19th century, wine had been growing successfully and without interruption in Empordà. But during the second half of that century a threat was waiting just across the border in France and increased Empordà wine exports to its northern neighbor (between 1872 and 1878 Empordà wine exports rose by 350%). Known for some time, the phylloxera plague that was killing the French wine industry was closely monitored, but as no one knew the vector of transport, little was to be done but sit and wait for it to pass. In 1879, the first symptoms started to show in Alt Empordà with the first recorded affected vineyard in Rabós. In just a few months the pest had made its way to other parts of Empordà and by 1881 it had affected coastal areas and basically all of Catalonia. In France, it was discovered that the cause of the plague was an insect and replanting on indigenous American grape root stock would solve the problem. Learning this, many winegrowers in Alt and Baix Empordà started replanting but many did not have the means to do so and countless vineyards were lost that to this day still stand empty. To get an idea of the extent of the damage, before the phylloxera plague Empordà had about 40,000 hectares of vineyards and today they lay claim to only 2,000. The few small winemakers who survived phylloxera and continued to produce, survived fairly well throughout the first half of the 20th century. But they eventually found that there was safety in numbers. From the 1930s onward, cooperatives were formed in towns across Empordà such as Espolla (1931), Pont de Molins (1935), Vilajuïga (1947), Roses (1952), Mollet de Peralada (1954), Palau-Saverdera (1956), Capmany (1959), Pau (1961), Rabós d’Empordà (1961), Vilamaniscle (1961), Garriguella (1963), and Sant Climent Sescebes (1964). While there were still countless small wineries, these large cooperatives worked to produce and market the wines they produced very efficiently. By sharing production costs among their members, production became easier and allowed the purchase of more modern machinery such as hydraulic presses. One of the downsides was that high production vineyards were preferred over those that produced less. This meant disregarding more flavorful grapes such as the ones from vineyards on the mountainous terraces of Cap de Creus which then went in to a decline. The 1960’s and 70’s saw the arrival of what many winemakers in the region dub, The Second Plague. Tourism and beach tourism at that took off at a massive scale. Vineyards that were near the beach were torn out to make room for more profitable ventures like hotels and holiday apartments. The labor-intensive work of tending to vineyards was abandoned by the locals who preferred tourism-related jobs. In 1972 the DO appellation of Ampurdán-Costa Brava (with the Castilian spelling) was created, but the wine that was being produced did not improve in quality despite the creation of this regulatory body. Tourists would buy bulk wine for the beach and high-quality, aged wines weren’t terribly desired. As if the tourism boom hadn’t done enough damage, in the 1980s the Spanish government introduced a program to pay people to rip out their old vineyards due to EU accession in 1986. Unfortunately, more often than not, the vineyards that were torn out were the more difficult to farm, older growth, low yielding, intensely flavored grapes—in other words, the best vineyards. However, at the turn of the 21th century, things started to change. Some vines were started to be replanted and instead of tearing out old growth vineyards, they were sold to those who wished to continue making wine and saw their value. Techniques and equipment were modernized, such as the generalized introduction of stainless steel tanks, and controlled fermentation. 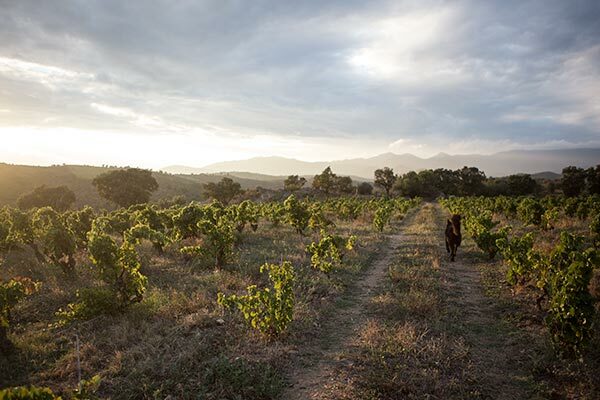 This first decade marked a massive change in Empordà winemaking. The DO changed its name to the more succinct “Empordà” in Catalan and dropped the Costa Brava beach reference which was deemed unnecessary. Small, craft wineries started popping up, headed by locals and foreign investors who both saw great potential in the region. People took an interest in replanting terraced vineyards in Cap de Creus that were either abandoned or killed off by phylloxera. Old, family wineries invested in more modern equipment and often sent the new generations to get university training. There was a renewed interest in local grape varietals and the overall quality of wine improved drastically. As the quality of the smaller producers improved, it forced the hand of the larger producers and the cooperatives improved as well. These days the entire region is back to producing highly noteworthy wines that regularly collect international awards and high-ratings, ranging from heavily modern wines in Modernist buildings to natural wines made in family cellars dating back 600 years. Of course, with grape production only at 1/10th of what it was at its height, there is still plenty of room for it to grow more.